The All-Party Parliamentary Group (APPG) on General Aviation has urged the new Secretary of State for Housing, Communities and Local Government to take affirmative action to “protect and enhance” the UK’s £3bn General Aviation sector. In a letter to The Rt Hon James Brokenshire MP congratulating him on his appointment as the new Housing Secretary, the 153 parliamentary members of the group warn Mr Brokenshire that “we are at a critical moment for UK aviation and […] you hold the key, through planning law, to adjust the balance in order to both build homes and protect an important sector of our economy”. The letter was sent as the public consultation on the draft National Planning Policy Framework closed. The framework sets out central Government guidance to local planning authorities, and despite explicitly recognising the importance of General Aviation for the first time ever, the all-party group has called for four minor amendments which would hugely strengthen the protection of aerodromes. The group’s campaign was supported by nearly 6,000 individual responses to the Government consultation, each believing that the UK’s world-class aviation sector should not be destroyed and that Government’s short-sighted approach to aviation needs to change. 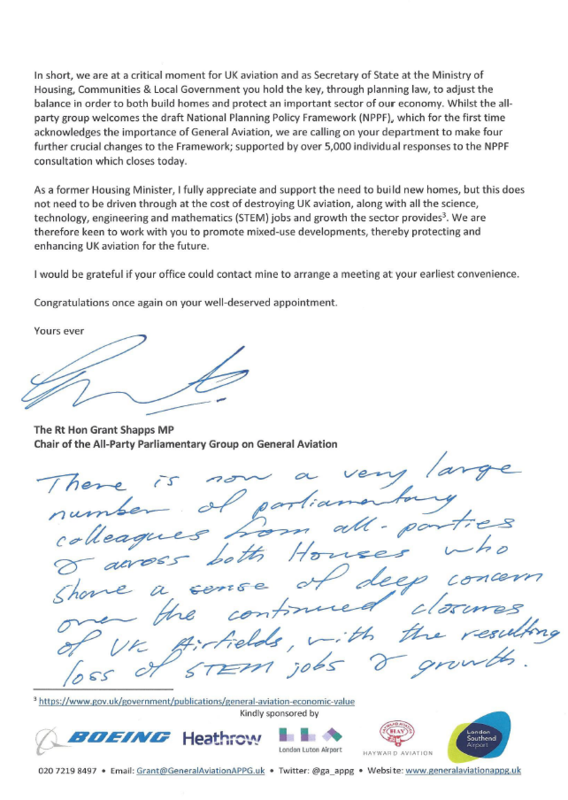 Commenting on the letter, Chair of the all-party group Grant Shapps MP said: “I congratulate the new Secretary of State for Housing on his appointment, but 153 parliamentary colleagues are clear that right at the top of his inbox should be protecting our valuable General Aviation sector. 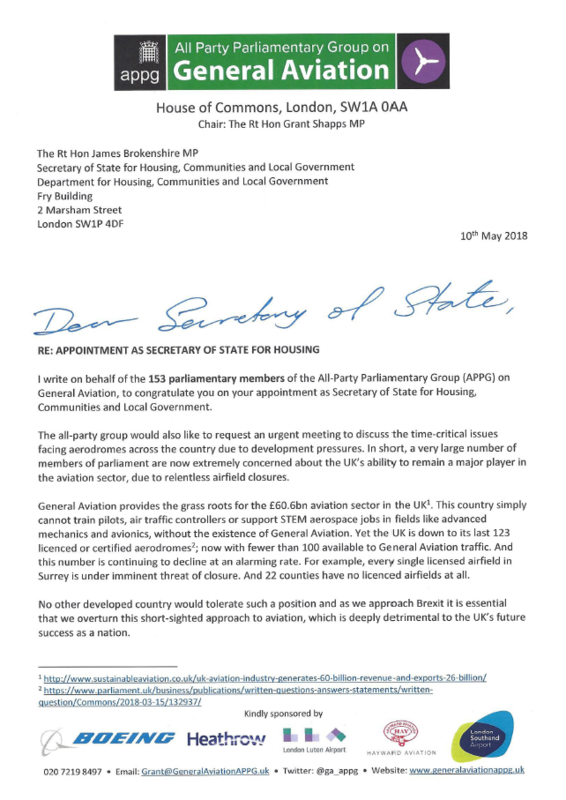 The full letter to the Secretary of State for Housing, Communities and Local Government can be read below.